Newly designed Pressure Lite(TM) toilets raise the bar for exceptional bulk flushing performance. This Highline(TM)/Wellworth(R) Pressure Lite toilet tank with right-hand trip lever, with its 1.0-gallon flush, provides a water savings of 5,000 gallons per year and offers complementary style for any bath or powder room. Kohler plumbing products mean beautiful form as much as reliable function. Combine with K-4303 or K-4303-L to create K-3531 Wellworth Pressure Lite 1.0 gpf toilet or combine with K-4304 or K-4304-L to create Highline Pressure Lite 1.0 gpf toilet. This toilet tank combines water efficiency with the versatile style of the Cimarron collection. A 1.28-gallon flush provides significant water savings of up to 16,500 gallons per year, compared to a 3.5-gallon toilet, without sacrificing performance. This tank features innovative AquaPiston(R) technology, a patented flush engine that delivers a fast, powerful, and virtually plug-free flush. Pair this tank with the K-4829 or K-4347 bowl for a unified look. This Cimarron tank combines high-powered flush performance with a classic style that suits traditional or contemporary decors. The tank features innovative AquaPiston(TM) technology, a patented flush engine, that delivers a fast, powerful, and plug-free flush. Pair it with a K-4347 Cimarron round-front bowl for a unified look. The KOHLER touchless toilet is the no-touch flush for your home. Just hold your hand over the tank sensor to activate the flush. No handle to touch means fewer germs to pick up or leave behind. This Cimarron tank features innovative AquaPiston technology, a patented flush engine that delivers a fast, powerful, and virtually plug-free flush. Its 1.28-gallon flush provides significant water savings of up to 16,500 gallons per year, compared to 3.5-gallon toilets, without sacrificing performance. Pair this tank with the K-4347 bowl for a complete toilet. Featuring the elegant architectural look of the Memoirs collection with Classic design, this toilet tank delivers water-conserving flush performance combined with rounded lines and traditional style. The 1.28-gallon flush offers up to 16,500 gallons of water savings per year, compared to a 3.5-gallon toilet, without sacrificing performance. For added convenience, this model features an insulating tank liner that helps prevent condensation on the outside. Pair this tank with the K-4380 bowl for a matched ensemble. 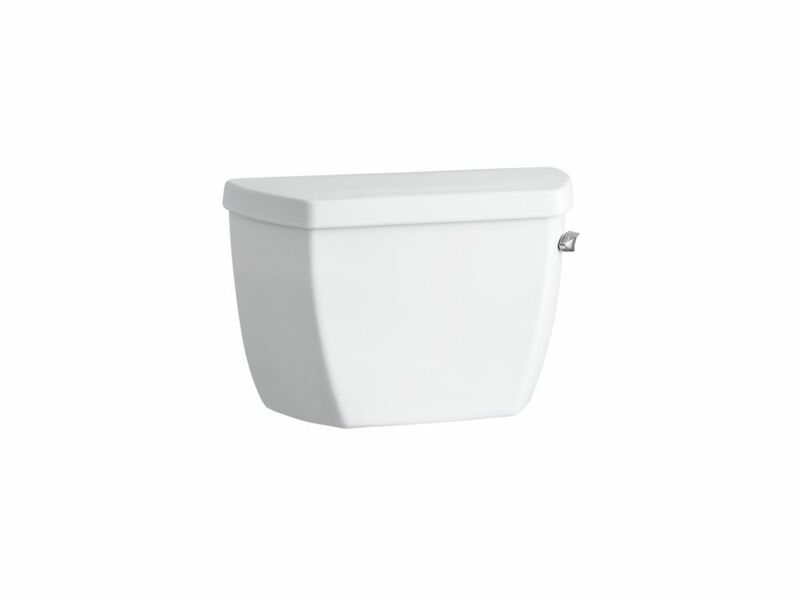 Highline Classic 1.0 Gpf Toilet Tank With Tank Cover Locks And Right-Hand Trip Lever In White Newly designed Pressure Lite(TM) toilets raise the bar for exceptional bulk flushing performance. This Highline(TM)/Wellworth(R) Pressure Lite toilet tank with right-hand trip lever, with its 1.0-gallon flush, provides a water savings of 5,000 gallons per year and offers complementary style for any bath or powder room.